Syrian refugees in the United States say they are horrified by the grim images showing the aftermath of a suspected chemical weapons attack in their home country that killed more than 80 people, including at least 27 children. “It’s extreme,” Samer Dukhar tells NBC Boston. Dukhar left Syria just after the civil war broke out in 2011. He now lives in Manchester, New Hampshire, and said he learned of Tuesday's dawn attack on Facebook after relatives and friends began posting photos and videos from the scene. The images are from the Idlib province, the region Dukhar called home for more than 25 years, now devastated by chemical warfare. A man who lost his wife, two children and other relatives in the suspected chemical attack in Idlib, Syria, wept while visiting their graves on Wednesday. “You see, they are killed without a single drop of blood, they look like they are sleeping, but they are not – they are gone,” Dukhar said, while watching a video posted on social media by a friend in Syria. Activists in Turkey have reported the death toll at about 100, with more than 400 injured, NBC News reported. “It’s really chaos now, people are scared, they don’t know what’s coming next,” Dukhar said. Bashar al-Assad has denied responsibility, but Dukhar says there’s no question in his mind that the country’s president is the mastermind behind the attacks. “He needs to be held accountable,” Dukhar said. Six years ago, Dukhar stood with hundreds in his hometown to protest the Assad regime in what he thought would be a revolution. But the government responded by killing civilians, and the uprising against President Assad gradually turned into a full-scale civil war. President Trump met with King Abdullah, the Jordinian leader, at the Oval Office on April 5, one day after an apparent chemical weapons attack in Syria that left dozens of people, incuding many children, dead. During a photo op, Trump commented on the attack, calling it an affront to humanity. The same day, U.N. Ambassador Nikki Haley criticized Russia for the fact that chemical weapons were even in Syria. “Almost every single family has lost somebody,” Dukhar said. 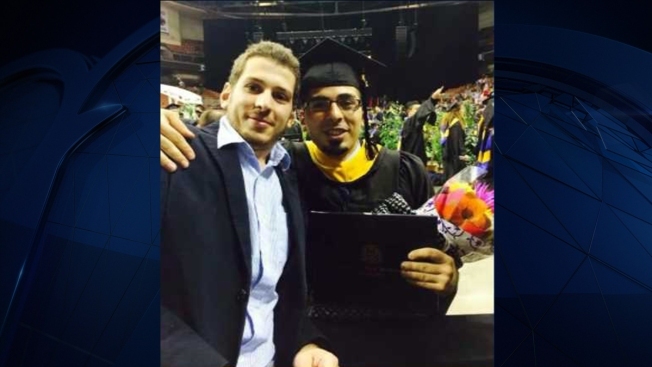 Since migrating from Syria, Dukhar has earned a master’s degree in the U.S. and created a Facebook page to help connect other refugees in New Hampshire. He hopes someday it’ll be safe enough to return to his birth country and rebuild.